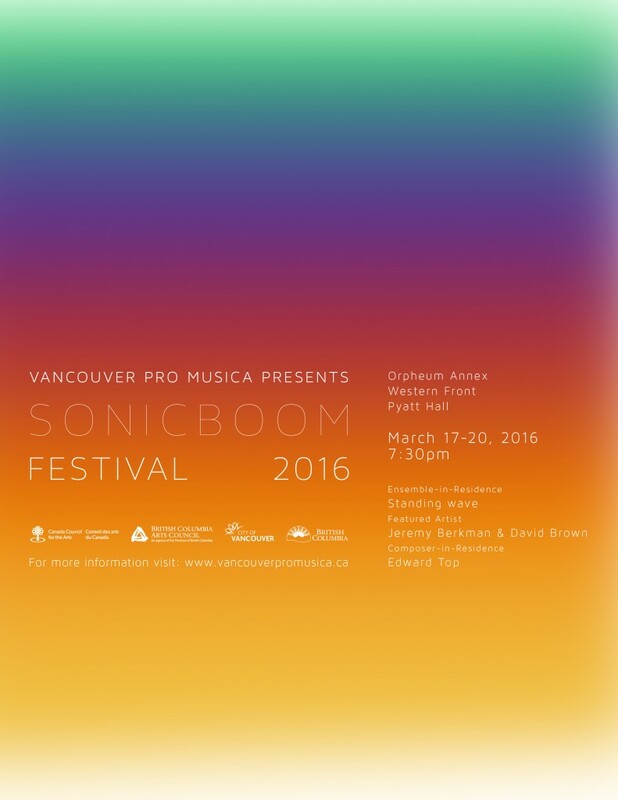 Vancouver Pro Musica invites any and all BC composers to submit new works for presentation at the 29th Annual Sonic Boom Festival. This event will be held March 17-20, 2016 at various venues in Vancouver. Deadline for submission is December 11, 2015. The festival comprises four evening concerts, with pre-concert talks given by our composer-in-residence. One concert is devoted to Standing Wave, this year’s Ensemble in Residence and will include a new piece written for this event by Edward Top; the Featured Artists are Jeremy Berkman (trombone) and David Brown (Bass); and the final two concerts to submissions for solo performers and various mixed ensembles of up to four performers. Composers are invited to submit a maximum of two works for consideration across the three categories; however, at most one work per composer will be selected for performance. This year, we are introducing a theme for our Friday, March 18 mixed ensemble concert: “Mix-Genre”. Inspired by composer-in-residence Edward Top’s recent arrangement of Jeff Hanneman’s Angel of Death for Standing Wave, we would like to invite composers to consider submitting pieces that explore the pluralism and eclecticism of mixing, combining, mashing, or mutilating different musical genres. Please note that submitting a themed piece will not exclude any submission from consideration in all other categories, though our aim is to program a full concert of theme-inspired works. The Call for Scores for our Student Composers’ Masterclass, Violin+Piano (March 20, 2016) will be announced separately. Please check our website in the near future to submit for this event. Made up of six of Vancouver’s most sought-after musical multi-taskers, Standing Wave is dedicated to commissioning and performing contemporary chamber music by Canadian and International composers. The group’s six members—flutist Christie Reside, clarinettist Anne-Katherine Coope, violinist Rebecca Whitling, cellist Peggy Lee, pianist Allen Stiles, and percussionist Vern Griffiths—venture into a wide array of musical worlds with passion and assurance. From the intricate complexities of the music of Howard Bashaw and Chris Paul Harman, to the bold avant-garde jazz of Tony Wilson, and the anarchic electroacoustic imaginings of Giorgio Magnanensi, the ensemble has commissioned and premiered over 75 works in its 24 year history. Since its formation in 1991, Standing Wave has presented an annual season of concerts in Vancouver, has toured across Canada, and been featured as part of the Vancouver New Music Festival, the Victoria Symphony’s New Currents Festival, and the Vancouver International Jazz Festival. In 2014 & 2015, Standing Wave performed the opening concerts of the first & second VSO New Music Festivals. In 2011, Standing Wave was the ensemble in residence at Vancouver Pro Musica’s Sonic Boom Festival, and was featured over three nights at Vancouver’s International PuSh Festival, performing ALL, the ensemble’s multimedia collaboration with award-winning filmmaker Mina Shum. Standing Wave has released three CDs: Liquid States (2013), Redline (2007), and a self-titled recording (1991). The ensemble has been recorded many times for CBC Radio; the ensemble’s November 29, 2010 and May 31, 2011 concerts were each broadcast on CBC’s The Signal. Since 2003, Standing Wave has been an Ensemble in Residence at the UBC School of Music. A graduate of Juilliard School of Music, Oberlin Conservatory and College (with degrees in music and economics) trombonist Jeremy Berkman currently plays with and leads the education and community engagement efforts of Vancouver’s award winning Turning Point Ensemble (TPE). He performs with the Vancouver Opera Orchestra, A Touch of Brass Quintet, and the Jill Townsend Big Band. With TPE, Jeremy has co-led a number of large scale collaborations and in 2011 was honoured with Vancouver’s Mayor’s Arts Award (Music). He has contributed to over 30 commercial recordings, and is featured in Still Image (music of Owen Underhill on Centerdisc). With The Peggy Lee Band he has recorded five cds, toured nationally and internationally, and been nominated for a Juno Award. Acknowledged by Dutch newspaper NRC as “The Horror Composer” twenty years ago, Edward Top’s music since is finding a way out-of the pluralism of the postmodernist maze where he has replaced an ironic and contemptuous response to the grand narratives of modernism by a simpler tone of honesty and an economical use of material. Recurring motifs include the grotesque, sentimentality and the sublime. Top’s music is inspired by the symphonic tradition, Baroque forms, postminimalism, film noir, postrock, thrash metal, and the paintings of Hyronymus Bosch, James Ensor and Francisco Goya. His work often oscillates between different concepts using rich textures in detailed orchestrations. Born in The Netherlands in 1972 Edward Top has lived and worked in London, Bangkok, and Rotterdam. With his wife and baby boy he now lives in Vancouver after recently completing a three-year term as Composer-in-Residence with the Vancouver Symphony Orchestra. He studied composition with Peter-Jan Wagemans at the Rotterdam Conservatoire in The Netherlands where he also majored in violin. He later studied musicology at King’s College London. He has also worked with composers Pierre Boulez, Luciano Berio, Peter Eötvös and George Benjamin. Besides his responsibilities as Head of Composition at the Vancouver Academy of Music, Top has received commissions from several ensembles including the Schoenberg Ensemble, Holland Symfonia, Calefax, Vocaal LAB, Doelen Ensemble, Raschèr Saxophone Quartet, The Tempest Flute Ensemble and Standing Wave. His works have been performed by the Dutch Radio Philharmonic, Netherlands Ballet Orchestra and Peter Rundel, Tokyo Sinfonietta, Ensemble NOISE at San Diego New Music and the Formalist String Quartet in Los Angeles. The Doelen String Quartet has recorded his two quartets on CD. Sonic Boom welcomes all styles/genres and BC composers of all levels of experience. To submit, complete the online form at the bottom of this page. Payment in the form of cash or cheque will need to be mailed separately. Only submission forms completed through this website will be considered. Submitting composers must be residents of BC. Submissions must be received by 11:59 pm on Friday, December 11, 2015. Works must have been composed in the past three years. Composers will be expected to attend the concert for their work. Flute (doubling alto and piccolo), clarinet (B-flat, doubling E-flat and bass), violin, cello, piano, and percussion. Submissions including other instruments will not be considered. Works must be scored for a minimum of four (4) performers, up to the full ensemble of six (6). Maximum duration: 8 minutes. Please note that time limits will be strictly enforced to allow as many pieces as possible to be programmed. Note: Standing Wave submissions will go through a two-step selection process. A preliminary selection of pieces will be played at a reading session on January 17, 2016. Composers selected for this round should submit parts to Vancouver Pro Musica by January 9, 2016. After the reading session, composers may make revisions based on their experience at the reading session. Revisions are due February 12. Works must be scored for both trombone (tenor or alto) and bass (upright acoustic, or 5-string fretted bass with volume, chorus, delay/flange pedals.) Solo pieces will not be considered. Works must be scored for four or fewer performers. Video projection will be available upon request. Proposals for mixed media (dancers, theatre, etc. ), web-based technologies, public art happenings, sonic installations, or other auditory new media works will be considered, but may be limited due to technical requirements. Please include thoroughly detailed documentation to aid the selection committee in understanding the technical details of the work. Vancouver Pro Musica will contact all the submitters by early 2016. While Pro Musica wishes to be as inclusive as possible, production costs, time constraints, and other practical concerns may require that not all submitters will have a work selected. In the event that these considerations do not permit the performance of all submissions, Vancouver Pro Musica will employ a panel of experienced composers to guide selection. Decisions of the panel will be final. Composers selected for performance must be ready to provide all required performance materials including parts. Those whose works are presented will receive a recording of their work for non-commercial demo purposes. All composers who submit, regardless of whether or not their piece is selected for performance, may attend any Sonic Boom event free of charge and will become members in good standing of Vancouver Pro Musica without being required to pay dues. December 11, 2015: Score submission deadline. Early 2016: Submitters notified of selection results. Rehearsals with composers will be arranged individually. November 1 2015, 10am – 2pm: Workshop at the Goldcorp Centre for the Arts, Music teaching studio, room 4350. Mid-December 2015: Submitters notified of preliminary selection results. January 9, 2016: Parts due. January 17, 2016, 10am – 2pm: Reading session at the Goldcorp Centre for the Arts, Music teaching studio, room 4350. February 12, 2016: Revisions due. Late February to Early March: Submitters notified of final selection results.